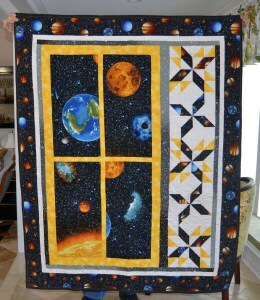 This is my Star Wars quilt because the young man it is going to is a Star Wars fan. It is supposed to be for his February birthday. He will get an early birthday present because I’m so excited with the finished product. Okay, so there are no pictures of R2D2, Luke Skywalker or Chewbacca as part of the design. Use your imagination and let us believe that this is the view from that galaxy far, far away. 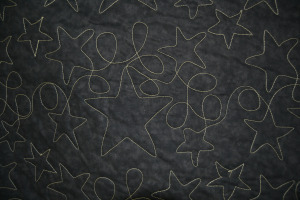 Quilting by Colley Haynes, Newell, Alabama.